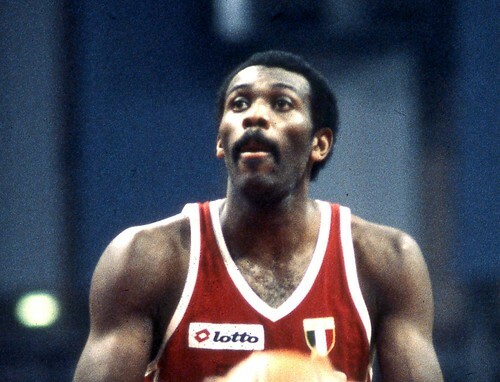 No player in the Italian League could be considered more important and famous than Bob McAdoo when he signed to play in Milano. It wasn’t just because his brilliant career in the NBA. Unlike many American stars in Italy, he was very known by Italian fans, because his reputation and also because he was playing for the Los Angeles Lakers during a time when NBA games started to become a fixture on Italian TV but the teams broadcasted were always the same, the most important, Lakers included. So McAdoo was a real star, he had played one year for Dean Smith at North Carolina, was drafted with the number 2 pick and was a perennial star in the League. He was the NBA leading scorer three times, he was a 5-time All-Star and in 1975 the league’s MVP playing for the Buffalo Braves. He played also for the Knicks and the Celtics, but those were very difficult years for the historical franchises and Bob developed a label as a talented player, a scorer but a selfish one, a big player but only for mediocre teams. His career turned for the best toward the end when Pat Riley proposed him to ensure quick points off the bench for the Lakers. McAdoo, used mostly as a sixth man, won two NBA championships in 1982 and 1985, showing his trait as a winning player, a generous and unselfish one, too. That was the player, Dan Peterson decided to bring to Milano. When he left the Lakers, he played briefly in Philadelphia but in the summer of 1986 he was ready to come to Italy. Olimpia didn’t listen to anybody. He was 35, he could’ve been demotivated, but Peterson trusted his guts. And McAdoo was signed. At the end, his development was very similar to the Joe Barry Carroll’s one, but JB was in the middle of his NBA career, stayed one season, came back to the NBA and never again experienced those feelings. McAdoo stayed four years, played for the Grand Slam team, won another European title in his second season and another Italian championship in the third. He felt so good in Italy that in 1990, when the big Olimpia’s cycle identified with D’Antoni and Meneghin finished, he simply moved to Forli where he met his wife Patrizia and also played a couple games in Fabriano. Making him an unforgettable player were not just the big wins or the extraordinary stats (he averaged 27.3 points per game in the Italian league playing 199 games, in Milano he had 28.1 points per game in 1987/88), the mid-range jumper (in 1988 he shot 60.3% from two attempting more than 17 shots per game), his terrific skills, his rebounding efficiency (10.2 per game in his first season) but also the little details demonstrating his unselfishness and winning mentality. The blocked shot he made to preserve the Geneva’s win over Maccabi in the European final in 1987 against Maccabi or even the dive to keep Alberto Tonut from scoring in game 5 of the 1989 Italian league final. Born in Greensboro, North Carolina in 1951 (25 September), McAdoo played four seasons for Olimpia, wearing the number 15 when in the NBA he used to play with the 11 (not in New York, where he wore the 21). Once he finished playing basketball, he became a coach, in the Miami Heat coaching staff where he won the NBA championship in 2006 (under Pat Riley) and in 2012.